To fully comprehend the mind set that led to the events of 9/ 11/2001, it is important to understand the history of the Bush family, the CIA, and the leadership of the Republican party, in the years prior to and after Hitler became Chancellor of Germany. Hitler rose to power on the backs of his own private terrorist organizations, the SA and SS (1,2,3). Hitler also received considerable financial assistance from transnational corporations, including those directed or controlled by Prescott Bush and his associates, Harriman, Walker, and Rockefeller (4,5). Hitler had been seeking power, to become the leader of Germany, since the early 1920s. Following the failed “beer hall putsch” in November of 1923, and Hitler’s subsequent brief imprisonment, Hitler had vowed to take power “legally” through the ballot box. In 1932, as his storm troopers ran amok and the next presidential election neared, Hitler was in desperate need of an infusion of cash. It was his intention to again run against von Hindenburg for the Presidency of Germany. Hitler required lots of money if he was to defeat the venerable old general. The attendees included the owners and representatives of Germany’s largest companies and corporations including those that were controlled or directed or in business with Prescott Bush, his father-in-law George Walker, and their associates, Harriman and Rockefeller: Standard Oil, IG Farben, Hamburg-Amerika shipping, Consolidated Silesian Steel Corporation, German Steel Trust’s Union Banking Corporation, etc. (4,5,8). Hitler explained to this moneyed-elite, that he was in favor of eliminating the unions—which is exactly what he did after coming to power. The industrialists were all for that. Hitler also explained he was for total managerial freedom, and that once he came to power the Nazis would begin public works programs and a massive rearmament program that would be directed by the leaders of industry—the wealthy and powerful men in his audience. The government would pay these men to rebuild and re-arm Germany. He certainly had their attention now. Hitler not only offered them hope, but catastrophe. Communism would destroy them, he explained. If the communists came to power they would confiscate the factories, the private property, and the wealth of the aristocrats and moneyed elite. Hitler explained, “Bolshevism, if unchecked, will change the world as completely as Christianity. If Communism continues unchecked, three hundred years from now Lenin will be regarded not only as one of the revolutionaries of 1917, but as the founder of a new world doctrine and will be worshipped as much as Buddha.” Only the Nazi party, he warned, could stem the Red tide.Only the Nazi party could lead Germany back to greatness as a world power. Only the Nazi party was offering hope and business opportunity—the opportunity for unlimited growth and unlimited wealth. Within days Hitler and the Nazis were in receipt of incredible sums of money which Hitler put to use in the coming election, and to finance terrorism —terrorism which was funded and supported by companies associated, directed, or controlled by Prescott Bush and his partners (4,5). Hitler believed in the power of terror. Terrorism works. As summed up by Hitler in his book, Mein Kampf: Terror is the most effective form of politics. The people must never know if they or their loved ones will be maimed or murdered. They must always feel they are at risk of suffering a horrible death. They must always feel as if the iron hand of terror may strike at any moment, for any reason, or for no reason at all. They or their neighbors may be killed or maimed at any time, at any place—at home, in bed, while making love, while kissing their children good night. Through brutality, physical terror and violence we are able to gain mastery over the soul and the mind of our enemies. We win by making them afraid. In 1932, Adolf Hitler, flush with the cash that was pouring into his coffers, prepared for the next election by unleashing terrorists upon the people. Germany, in 1932, was thrown into “a state of civil war.” “There was a wave of political violence and murder such as even Germany had not previously seen,” wrote William Shirer (3). Even so, despite the terror and an incredible propaganda blitz financed by his friends in commerce and industry, Hitler lost the election. Again, he resorted to terrorism in order to undermine the government. His hope was that if the government fell, President Hindenburg would be forced to appoint him Chancellor. “We must be ruthless,” Hitler announced. His terrorists gangs were again ordered to run amok, and the government began to totter and fall. And as it fell, the government was given a final shove by Hitler’s friends in industry and commerce who prevailed upon Hindenburg to appoint Hitler Chancellor and to install a Nazi government (2,3). In 1933, Hitler was appointed Chancellor. The Nazi government immediately unleashed its storm troopers, who swept through the streets, arresting, dragging off, and then beating up and torturing all enemies of the Nazi State who were then confined, if they lived, in one of the numerous make-shift concentration camps that were springing up all over Germany. By the end of 1933, over 50 impromptu concentration camps were established—usually in cellars and bunkers (1,2,3). Goering, as Minister President of Prussia controlled the Prussian police. He also created his own secret police force, Abteilung IA, which he had exempted from Paragraph 14 of the Prussian Administrative Police Law, and which was rechristened the Geheime Staatspolizei, the Secret State Police. It was a bureaucrat in the post-office who invented the abbreviation, Gestapa; and thus the Gestapo was born (1). It was Goering’s Gestapo, along with the SA and SS which led the terror campaign to arrest, beat up and to destroy anti-Nazi organizations and individuals without regard for the law. The Gestapo was above the law and it had no obligation to abide by the law. Its job was to annihilate and exterminate all political opposition. It was not just enemies of the Nazis who were murdered and tortured, but anyone and everyone who had somehow offended a member of the SA or SS. German citizens were being beaten with iron bars and truncheons and then starved and whipped (1,2,3). In April 1934, Goering appointed Heinrich Himmler to be deputy chief of the Prussian Secrete Police. Soon the Gestapo became an arm of the dreaded SS (which had replaced the SA as Hitler’s private terrorist army). The Gestapo and the Nazi SS came under the control of the greatly feared, Heinrich Himmler (1). Those who were counted among Himmler’s “circle of friends” included the leading business men of Germany, several of whom were in business with Prescott Bush, Harriman, Dulles, and Rockefeller. Himmler’s dreaded SS recruited its members from the upper echelons of society, i.e. the blue bloods, bankers, and aristocrats. As detailed in Heinz Hohn’s, The Order of the Death’s Head, “the first arrivals were from the aristocracy. Even before the Nazi seizure of power certain great names had been added to the SS list” including Grand Dukes, Counts, and Princes. However, after Hitler came to power, “in 1933 there came a further infusion of blue blood. Many of the senior SS posts were occupied by the ruling class elite. The primary requirements in the SS, were money and officer material, and they could come only from one source—the old-established ruling class elite—the nobility, the world of commerce and the financiers… Germany’s captains of industry” (pp. 152, 153, 158). The SS sported, along with its SS insignia, a skull, the “death head,” and was known as the “brotherhood of death” (1). The SS could, in many ways, be likened to a business-savvy Satanic organization. It was the SS which ran Hitler’s exterminationand slave labor camps. The American chapter of the “Order of Skull and Bones” also has its roots in Germany (see chapter 3). Its headquarters? Yale University (7) the alma matter of Prescott Bush, George H.W. Bush, and George W. Bush. Like its German counterpart, the American “brotherhood of death” also known as the “Order of Skull and Bones” recruited its members from the upper echelons of society, i.e. the blue bloods, bankers, and aristocrats. Among is members: Prescott, George H.W. and George W. Bush (8). Hitler had always intended the SS to be his personal instrument of terror. It was to be mysterious, sinister, a black-robed secret order that was totally above the law, but whose tentacles reached into every German home. Listening and watching with hundreds of thousands of unseen eyes, the Gestapo, aided by informers and 2,800,000 men in the regular police, duly noted any and all suspect behavior that even remotely suggested even a hint of treachery or opposition to Nazism. The SS ruthlessly weeded out all enemies of the Nazi state. Thousands of German citizens, including politicians and labor leaders, were either murdered or confined to one of the more than 20 concentration camps or the 160 affiliated labor camps where they were used as slave labor (1). These slave laborers not only earned money for Himmler’s SS, but those industrialists and bankers who helped the Nazis come to power. Some of those banks and corporations were directed by or directly connected to Prescott Bush and the Rockefellers (4,5,9). Prescott Bush and his partners were in fact in business with several leading Nazis, such as Friedrich Flick (4,5,10) who later became Hitler’s minister of the Interior (2,3). IG Farben (11,12) the company that developed the poison gas to kill Russians, gypsies, and Jews, and which also ran several of the concentration camps, was in partnership with Rockefeller’s Standard oil, as well as in business with Bush and associates. Likewise, Bush and his partner, Harriman, were in business with Fritz Thyssen (4,5) who had been supporting Hitler since the early 1920s (2,3). Likewise, Prescott Bush and associates and Standard Oil, were in business with IG Farben, providing loans, executive expertise, and petroleum-related products (13). 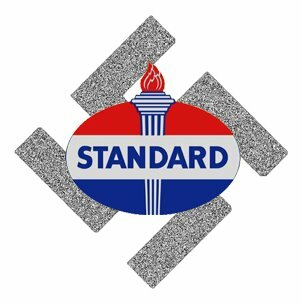 IG Farben in fact owned a huge stake in Standard Oil. IG Farben, in association with Standard Oil, used that expertise to develop poison gas and petroleumrelated products to drive the Nazi war machine. IG Farben—a consortium of companies that included Bayer— also ran the slave labor and death-camps, the most notorious of which was Auschwitz where 83,000 people worked as slaves. IG Farben/Bayer not only worked people to death, but provided funds, scientists, and medical personnel to conduct horrible experiments on inmates. Throughout the 1930s, and the early 1940s, the Bush family and other “Bonesmen” formed an unholy alliance with the SS and Hitler’s Nazi Germany. Indeed, the evidence indicates that Prescott Bush was not just doing business with the Nazis and profiting from the use of slave labor, but that his company became members of the “Friends of the Reichsfuhrer SS,” that is, friends of SS Gestapo chief, Heinrich Himmler. As detailed by Heinz Hohn (1), the Hamburg-Amerika shipping company, and its directors, were honored as “Friends of the Reichsfuhrer SS.” Prescott Bush was one of the directors of the Hamburg-Amerika shipping company (13, 14). Hamburg-Amerika was seized by the U.S. government in August 1942 along with another Bush company, Union Bank in November of that year (12), for trading with the enemy or for acting as Nazi-fronts and for distributing Nazi propaganda in the United States. Indeed, Congressional hearings in 1934 established that Hamburg-Amerika routinely provided free transatlantic passage for those distributing Nazi propaganda (15). Why would Bush and friends import Nazi propaganda? In order to destroy democracy in the United States. “A clique of U.S. industrialists is hell-bent to bring a fascist state to supplant our democratic government and is working closely with the fascist regime in Germany and Italy. I have had plenty of opportunity in my post in Berlin to witness how close some of our American ruling families are to the Nazi regime.” —William Dodd, U.S. Ambassador to Germany in 1937. Before his companies were seized, Prescott Bush freely admitted and described his own role in running the Hamburg-Amerika shipping company: “Three or four of us were really running the business, the day to day business all the administrative decisions and the executive decisions. We were the ones that did it. We were the managing partners, let’s say. What other proof do we have? Emil Helfferich, the chairman of Bush company, Hamburg-Amerika, frequently wrote out checks to Heinrich Himmler (payable on a special Standard Oil account). According to U.S. intelligence documents reviewed by author Anthony Sutton, Helfferich was still making these payments to the S.S. in 1944 —the same S.S. which was rounding up, enslaving, and supervising the mass murder of “subhumans” (Russians, Jews, Gypsies, Poles, etc. ), at IG Farben’s death camps. Thus as a director of the Hamburg-Amerika shipping company Prescott Bush, the father of George H.W. Bush, became “partners” with and “Friends of the Reichsfuhrer SS,” and thus provided financial support for a Nazi terrorist organization (the Gestapo) that spied on, terrorized, and murdered not just German citizens, but Jews, Americans, and the peoples of Europe. “The Bush family were crucial players in setting up the industrial power behind the Third Reich.” -Robert Lederman, Philadelphia City Paper (1/18/01). “Certain American industrialists had a great deal to do with bringing fascist regimes into being in both Germany and Italy. They extended aid to help Fascism occupy the seat of power, and they are helping to keep it there.”—William Dodd, US Ambassador to Germany in 1937. “The Bush family fortune came from the Third Reich.” — John Loftus, former prosecutor in the U.S. Justice Department’s Nazi War Crimes Unit. Hitler and his SS, as is well known, murdered tens of millions of people, including six million Jews, and millions of other “sub-humans” including Germans who were retarded, disabled, or suffering from epilepsy and other disorders. This Nazi program was based on the emerging science of “eugenics,” a neo-Darwinian concept in which the State weeds out the weak, in favor of the strong; i.e. the sterilization and/or execution of mental patients, the insane, the retarded, the feeble minded, criminals, and physically disabled including those who are blind or deaf. The goal of eugenics is the purification of the race by preventing the breeding of inferior races and unfit individuals. Prescott Bush and his son, George H.W. Bush were enthusiastic supporters of “eugenics,” the weeding out of inferior humans. Before G.H.W. Bush became president, he frequently made remarks about the “down-breeding… of America” and sponsored hearings, such as one that took place in August 5, 1969, on the threat posed by black babies (16). We should not be surprised therefore to learn that companies directed or associated with Prescott Bush and his associates such as Rockefeller and Harriman, also supported the Nazi eugenics programs. As noted, Emil Helfferich, the chairman of Bush company, Hamburg-Amerika, frequently wrote out checks to Heinrich Himmler and his S.S.—the same S.S. which was rounding up and supervising the mass murder of “subhumans” at IG Farben’s death camps. The principle behind eugenics, is that only those with “good genes” that is, those of “good birth” and who are “well born” (i.e. aristocrats) deserve to live and to breed. Prescott and George H.W. Bush, as blue-blooded members of America’s aristocracy, and thus of “good birth” and “well born” were thus ardent supporters of eugenics, with George Bush later pushing for the sterilization of inferior races (16). Thus, being birds of a feather, Prescott Bush and his partner, Harriman, used the Hamburg-Amerika Line, to transport Nazi specialists in propaganda to the United States, including those advocating and practicing eugenics—and the Rockefellers did likewise (17). Prescott Bush was in business with the Nazis, his son George H.W. Bush would hire Nazis, and neo-Nazi advisors (9,18), and both would advocate Nazi practices such as eugenics, in order to purify the race. Indeed, both men even made arrangements for Nazis and those supporting Nazi policies to come to this country. Prescott Bush, of course, did not act alone. Bush was in business with his father-in-law, George Walker, the Harrimans, and the Rockefellers. And then there is the Dulles brothers, Allen Dulles acting as legal counsel to the Bush-Harriman-Rockefeller clique, as well as a go-between in setting up deals with leading Nazis. At the close of the second world war, Prescott Bush, Rockefeller, and Dulles were still in business with the Nazis, and assisted hundreds of Nazis to come to the United States, and to obtain work in the Republican party and in the OSS (5,9)—a spy agency which would later be named, the CIA (19). As revealed by the National Archives, as admitted by the CIA, and as reported by BBC and UPI (20), the CIA recruited and employed hundreds of high ranking Nazis, including Nazi General Reinhard Gehlen who placed his Nazi spy ring at the disposal of the United States following the close of WWII. Gehlen was Hitler’s senior intelligence officer on the Eastern Front during the war and was responsible for the torture and murder of millions of Soviet prisoners. Gehlen’s network of SS and Gestapo Nazi agents, not only in the East, but in Europe were secretly released from prisoner of war camps by U.S. intelligence officers (4,20), including Allen Dulles (4,24), the same Allen Dulles who worked for Prescott Bush and company, as a lawyer (25). Prescott Bush, Harriman, and the Rockefellers called upon the Dulles brothers to help cover up the fact that they were in business with the Nazis. Dulles was an excellent choice, because of his connections to the Roosevelt administration, and because, in the 1930s Dulles had helped establish several interlocking financial networks between IG Farben, Standard Oil and the ruling family of Saudi Arabia, the House of Saud. Dulles was well rewarded for his work and became the first director of the CIA. Gehlen’s Nazi CIA spy ring, became known as “the Gehlen Organization and received millions of dollars in funding from the U.S. until 1956” (UPI 9/20/2000). Additional files released by the CIA on April 29. 2001, indicates that hundreds of World War II Nazi war criminals ended up on the CIA payroll, including Klaus Barbie, the infamous “Butcher of Lyon.” Barbie was eventually convicted of crimes against humanity by a French court. Barbie was not the only “Butcher” that the Bush-Dulles clique helped to escape from justice.Nazi Major General Walter Dornberger who had been sentenced to death by hanging for war crimes was also welcomed with open arms (21). A U.S. Justice Department spokesman Eli Rosenbaum said “the files demonstrated hat the real winners of the war were Nazi war criminals” (21). Not surprisingly, the CIA, like the Gestapo, would employ espionage, propaganda, terror, chemical and biological warfare, including the purposeful infection and murder of American citizens to obtain its objectives (22, see also chapter 8). And, like the Gestapo, the CIA would be, as it still is, above the law. Hitler believed in using terror as a political weapon and to justify war and the destruction of his enemies. Terror would also play a major role in assisting him in pursuing one of his major objectives, an attack on the Soviet Union, and the seizure of the oil-rich states in the Caspian basin (2,3,23). The Polish division of the Upper Silesian Coal and Steel Company, in addition to fraud, had also failed to pay taxes to the Polish government. Millions were owed. The dispute would be settled, in 1939, with the destruction of Poland by Nazi Germany. Hitler, however, needed justification to attack an independent state which had done him no harm. His generals were reluctant to attack, as they knew that the German people and the international community were opposed to war (2,3). However, Hitler knew that he needed deeds not words. Days later, on August 31, 1939, operation “Canned Goods,” the code name for a “terrorist” attack on German citizens and German property, was carried out by SS men dressed in Polish Army uniforms (2,3). There had already been numerous “terrorist” attacks conducted against German property and civilians by SS men dressed as Polish soldiers. Hitler, however, needed one final grand attack to justify his war. On August 1, concentration camp inmates, who had been drugged and shot, and dressed in Polish uniforms, were displayed as evidence of unceasing Polish terrorism being waged on Germany. These “terrorist” attacks, including the final, August 31, attack on a German radio station, provided the justification for war. As the world later learned, these terrorists assaults on Germany were conducted by German SS agents under the watchful eye of Himmler’s SS and Gestapo (1,2,3).